I want to wish everybody a merry Christmas with lots of love, delicious food and drinks and cosiness! Last Sunday I played, much to my regret, my last match for 1. BV Mülheim. 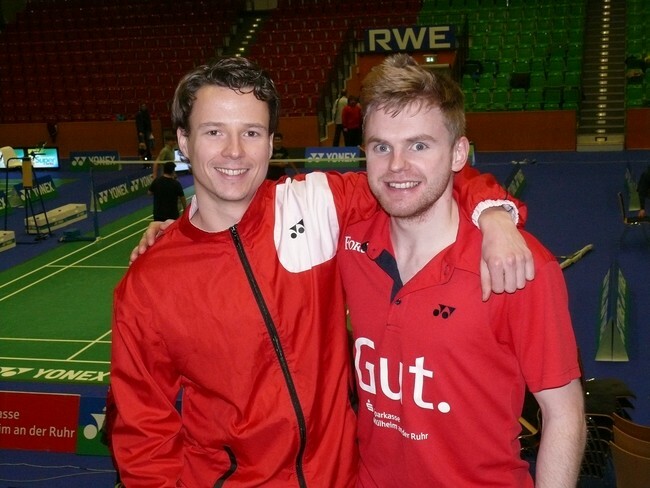 In the décor of the Yonex German Open, which is played this week in the RWE Hall in Mülheim and where I participated myself last year, I was eager to score the first point for my club. Together with Marcus Ellis, who was also playing his last match, I did what I had planned to do: winning. During the past four years Marcus and I have taken the majority of the men’s doubles for our account and we were a very good pair. It’s a pity that this is history now. All these years the first team of BVM was a close and well attuned group both during matches but also beyond. I like to thank my teammates, among whom also Judith Meulendijks who left the team earlier this season and our coach Boris Reichel, for a wonderful and memorable time. Last but not least I want to thank all volunteers and fans of 1.BVM who have supported and assisted the team as well as myself personally during the past 4 years. 1.BV Mülheim is a fantastic club!! As I very much like to continue playing badminton I sincerely hope I will be able to find a new club to which I can devote myself again. I keep you posted. Memberships of sport associations are becoming less and less popular nowadays. 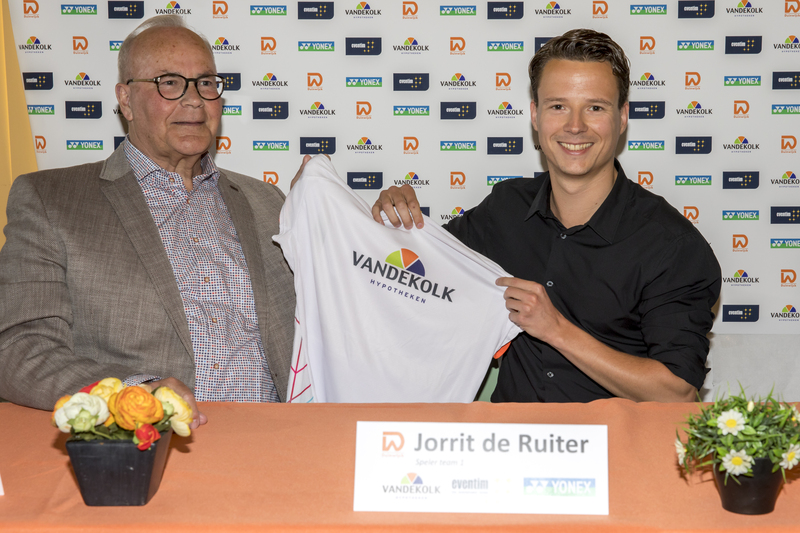 Unfortunately all the racketsports (Badminton, Tennis, Table Tennis and Squash) are suffering from a decrease in memberships in the Netherlands. Even a well-known sport as tennis has to deal with a decrease of 3000 members. Not to mention the numbers of badminton, table tennis and squash! A week ago I wrote an article about how to make badminton more popular and this week I found one of the answers. To promote at least two of these troubled sports, badminton and table tennis, the city of Amsterdam organised the so called Racketdriedaagse. A 3 day promotion to introduce these games to children in the age group 6-12. Over 50 children got the chance to find out if they would like to join a club. A very smart move was to invite their parents during the last few hours of day 3, because they are the ones who would have to pay for the memberships of their children. So to enthuse them was part of the plan. 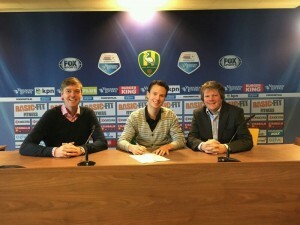 It worked out very well and it looks like both table tennis and badminton will get some new future talents on board! Mission accomplished! It is a fact that school-aged youngsters excersise less and less. With all the distractions of today it is not cool enough anymore to do sports, not to mention to join a sports club. Our badminton sport has also suffered severely from this trend. There are too few talented young players flowing to the senior levels and for years there has been a decrease in the number of players who are, via their club, member of the National Badminton Association. To bring this decline to a halt and reverse to a gain is a major challenge. A membership increase can only be achieved by means of a large number of youngsters joining badminton clubs and become sustaining members of the Association. Youngsters who have experienced that badminton is a fun sport and who can be enthused to get better at the sport through proper training and coaching. Schools are the ideal source to get youngsters enthusiastic about a sport provided they are willing and able to pay extra attention to it. Currently I am promoting badminton at schools. Through short promotional lessons I try to enthuse children in secondary education for the badminton sport and make them attend after-school badminton classes offered at their school. The ultimate goal is to have them join a badminton club in their neighborhood at the end of the school year. Good for our sport because there may be talents among these young guys and girls. Good for the schools as well as a child with an healthy and vital body will learn and perform better. A Win-Win situation! Tuesday August 11th 2015 during the magnificent World Championships in the Badminton Mecca, the Istora Senayan Arena in Jakarta, I played the last match of my international badminton career. I have decided to stop as a professional badminton player. After 18 years of badminton competition, of which the last 15 years as a professional athlete, a special period of my life has come to an end. I will now start with a new chapter. Recently it became increasingly clear that the funding for our ambitious tournament plan towards the Olympics 2016 in Rio, as drawn up by the Dutch Badminton Association, was not feasible. The financial support from the association (a personal budget) proved to me personally to be far from adequate enough to cover the costs of the 21 qualifier tournaments that Samantha and I would have to play. 21 tournaments which were and are essential to gain points for the world ranking. Additionally, we lacked progression towards the top 10 in the world in our mixed doubles and our position in the top 20 of the world ranking was not enough to get additional financial support. 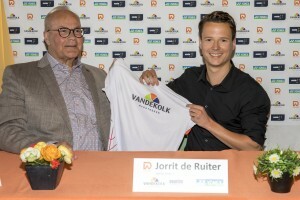 Neither from the Association nor from the Dutch Olympic Committee. For me it is not possible to compete on the highest possible level without these crucial contributions. With great pleasure and pride I look back on a wonderful time within the world of, in my view, the most beautiful sport there is. The badminton sport has taught me a lot and has led me to magnificent spots all over the world. In my early years, mostly in the smaller sports halls within Europe and in recent years in the world’s biggest arenas that exist within our sport. I have had the privilege to measure up to the world’s very best athletes at tournaments I’d only hoped to play, when I was a child. I celebrated successes, suffered defeats, dealt with disappointments, had lucky breaks and experienced euphoria. All these years I got (financial) support from people of different companies like e.g. Yonex and Footconnection, but also from individual people. I like to thank them all very much for their trust and confidence and the credits they gave me. They made it possible for me to be a professional sportsman throughout the years. They have made possible that I could achieve good performances, moments that I will always cherish. 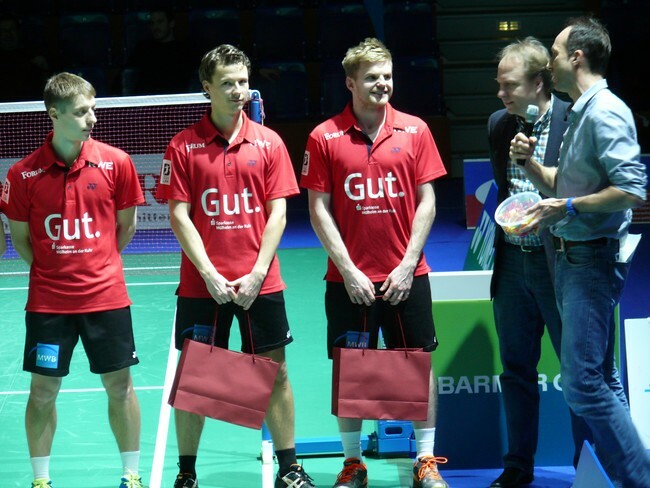 Naturally I also thank my partners with whom I have played together, my coaches, trainers, physios, masseurs and all other people who have been there for me throughout my badminton career. My biggest thanks go out to my parents, sister and girlfriend who always and I really mean always were and still are around. Family is the basis for everything and the basis is good! I am grateful for everything you meant for me and still mean to me. I love you! After our 4 1/2 week Asia and Australia tour we had a couple of days of training in Holland before we had to board another flight again. On Sunday June 14th we flew to New York for the first of two North American tournaments: The US Open and the Canada Open. New York is not really New York. In fact the tournament is held in Brentwood on Long Island at about an hour drive from the Big Apple. The first days we always use for training and getting accustomed to the time difference. The last mentioned didn’t cause any problems but the training was not a success. They had improvised badminton courts taped on an indoor athletics subsurface. Not exactly the ideal circumstances for a Grand Prix Gold tournament in the Olympic qualification year. I really wonder when BWF will finally open it’s eyes and start giving fines for such abuses. But more important are the matches we played. After a rather easy win in the first round we were facing a Taiwanese pair in the second round. We lost this match in the last 5 points of the third game. Completely unnecessary, very disappointing and harsh reality! As usual there is no time to linger in your disappointment, you are in a badminton roller coaster which never stops so we immediately focused on next week’s Canada Open in Calgary. Still I made time to pay a short visit to the Big Apple and enjoy this vibrant metropole. It was good to gain new energy and prepare for the trip to Calgary on Sunday. The last 2 editions of the Canada Open, a Grand Prix tournament, we made it to the finals. This year we were seeded fifth. Via two hard-fought victory’s on, again, concrete floors (Hello BWF!?) we reach the quarter finals. There we meet the first seeded German pair Fuchs and Michels whom we played 2 times before. We also know them from the German Premier League where we also meet them quite regularly. To be honest, in this match we had nothing to contribute. We were just outclassed. We lost the match by 15 and 12 and that was the tournament it was. Unfortunately these tournaments haven’t brought what I had hoped for, more victories and better playing. The last weeks we haven’t even come close to our top level which we reached at the end of 2014. The coming weeks we’ll have to find out how to get to that level again in order to perform at our best when we play the World Championships in Jakarta next August. I write this just before boarding my KLM flight back to Holland. After having been abroad 46 days out of the past 54 it is about time to go home! I wish all my followers and other badminton lovers a great summer and after that a great start to the new season. 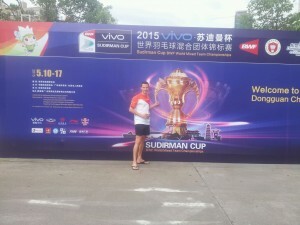 Yesterday a great organized Sudirman Cup ended with an anticipated title for superpower China. Japan was beaten 3 to 0 and who else than badminton legend Lin Dan scored the winning point. Every time again I am amazed how he can make our sport look so easy. His footwork, his movements on court and his unbelievably effective way of playing are unique. A pleasure to watch and secretly to be very jealous of! 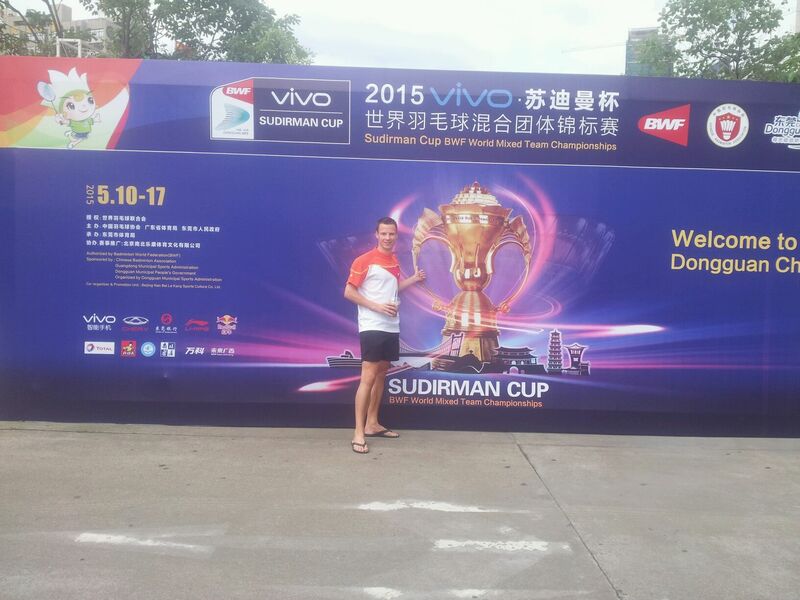 It was a pleasure to play in the arena specially built for the Sudirman Cup. Dongguan is a city where badminton is played just a bit more than in other Chinese cities, at least that was what one of our interpreters and assistants told me. In any case the matches were well attended. Moreover, there were 1.100 volunteers in and around the arena of which 600 residents and 500 students from Dongguan. For them this was a fantastic experience since they were chosen from many candidates to be part of this tournament. At any time of the day they were enthusiastic and incredibly friendly. Our first place in group 2 meant we had to play Hong Kong for the 13Th place in the tournament. When you are in group 2 it means that the 13th place is the highest position you can get. In fact it is a strange idea because you always want to play to win a tournament. As a country we will have to work hard during the coming years to improve our ranking in all areas and may be after some four years we’ll be able than to compete in the Champions group. If countries like Russia, England and Germany can do it, why not us? 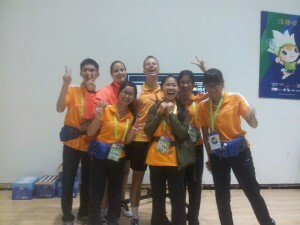 Moreover, the competition against Hong Kong was lost 1 by 3 and Samantha and I didn’t have to play the last match. Melbourne is a great city! In short, it’s a great trip so far and I fully enjoy it! Next week we have a tough draw. In the first round we have to play the Chinese Kai Lu and Huang Yaqiong who are in the top eight of the world ranking. At the World Championships we were beaten in two games but we will again analyze them and find a good strategy for that match. I’m very much looking forward to it! But now I’ll first enjoy Australia’s coffee capital, Melbourne!